Can it really work in the U.S.? Bernie Sanders certainly thinks so. 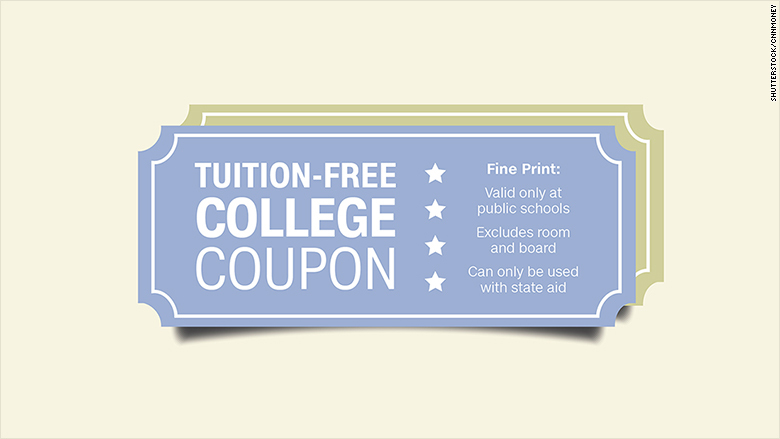 "Public colleges and universities tuition-free? Damn right! That is exactly what we should be doing," he said at the Brooklyn Democratic debate. To which Hillary Clinton replied: "If somebody promises you something for free, read the fine print." That covers about 68% of college students in the U.S., according to the Pew Research Center. Private schools would likely be excluded. They usually charge more for tuition, but often offer more financial aid. Some private schools like Harvard and Yale are already "debt-free," which means they won't charge you more than what they think your family can pay. Legislation proposed by Sanders last year would cover tuition and required fees. 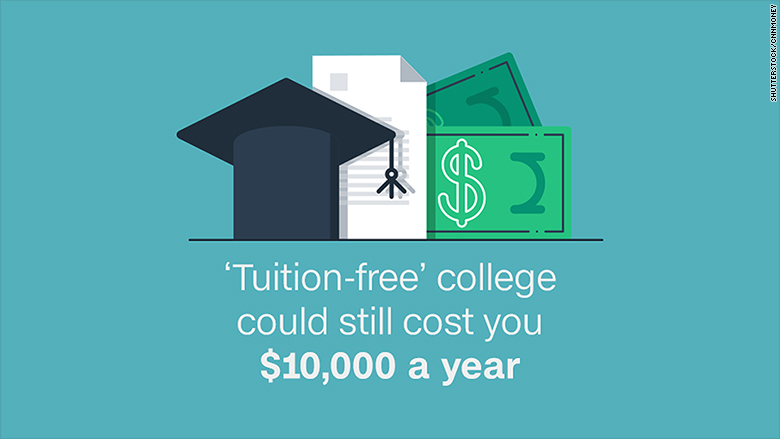 But at some colleges, it's room and board that hits your wallet the hardest. Students at public colleges paid an average of $14,000 this year, but only about $4,000 of that went to tuition, according to The College Board. The other $10,000 covered room and board. While that costs isn't automatically wiped away, Sanders doesn't want students to have to borrow money to pay for room and board, books and other living expenses. If it's determined that those cost more than what your family can pay, you'll get federal, state or college grants to cover the cost. A large percentage of families cannot currently afford the full cost of public college and end up borrowing money. In 2009, 60% of public school graduates had taken out a federal loan to finance their education, according to The College Board. Sanders would likely keep federal aid programs that offer grants and loans, and would require states to maintain their own need-based financial aid programs. His plan would also reduce the interest rate charged for federal student loans and expand the federal work study program. Sombody's gotta pay for it. Under Sanders' plan, the amount of money a college usually receives for tuition would now be covered by the U.S. and state governments. The feds would kick in 67% ($47 billion a year) and states would be on the hook for the rest ($23 billion a year). The additional funds from the federal government would come from what Sanders has referred to as a "Robin Hood tax on Wall Street." This would likely be in addition to what the government already pays for higher education. The feds currently spends about $76 billion -- mostly flowing to colleges through financial aid grants awarded to students and grants for specific research topics -- and the states pay about $73 billion, according to The Pew Charitable Trusts. First, Congress would have to act on implementing the tax on financial transactions. And then each individual state would have to opt to participate, which might mean chipping in more for higher education than they already do. Tennessee and Oregon have already made community college tuition-free using state funds. Tennessee's program started last fall, is funded from lottery revenue and costs an average of $1,165 per student annually. It brought a wave of new students to the state's community college system this year. Oregon has a similar program that will enroll its first students in August. These are called "last dollar" scholarship programs, so they kick in after students use up any federal grants or other scholarships. The city of Detroit is using private donations to fund a new free-tuition program for its community colleges. Eventually, some of the money will come from property taxes already earmarked for the program. Although it's not called a free-tuition program, Louisiana has one of the most generous scholarship offers. It's currently used by nearly 47,000 residents and covers the cost of tuition for students who meets certain academic standards. But funding for the program is in jeopardy as the state faces a massive budget shortfall.